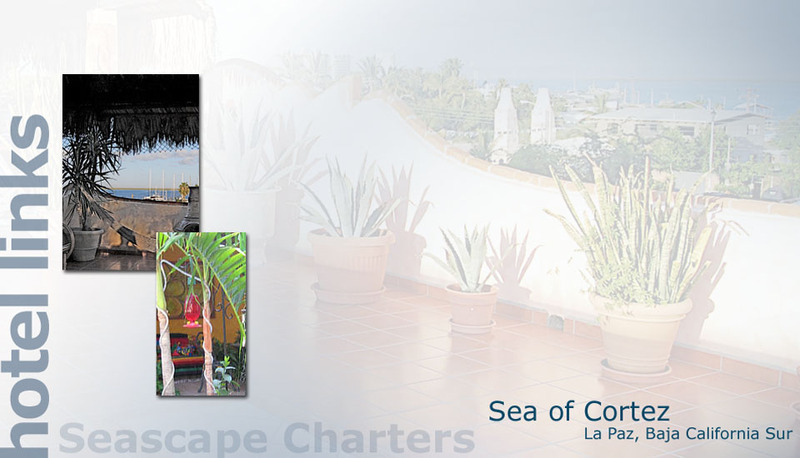 We are frequently asked to recommend a place to stay in La Paz. Weve listed several options based on price, convenience to our boats and preference of previous charterers, but others might deserve to be listed as well. If you are interested in a hotel not found on this list email us and well do our best to find out more. When you get back home, please let us know by email how you liked your hotelfor its convenience, service and price. ITS IMPORTANT TO US THAT YOU HAVE A GREAT STAY IN LA PAZ. This is a small hotel with just 14 rooms, mostly on the second floor...but oh, what a view from its third-floor palapa! They serve hot coffee in the morning, and there is a stove and refrigerator on the balcony where you can do light cooking and store food or drinks. Ask us about nearby restaurantsthere are many. Prices are very reasonable. Rates start at $65. 1-800-355-7140. Located about six blocks from downtown. www.posadalunasol.com. Its also home to Mar Y Aventuras, a kayak outfit.